Marian Call loves making music for you. She sounds a little like Joni Mitchell meets They Might Be Giants & Regina Spektor for bourbon & laughs. She hails from Alaska but can often be found touring North America and Europe, and she lives on Twitter. Her songs are quirky, geeky, eclectic acoustic confections that taste like vanilla-cinnamon-chipotle something. 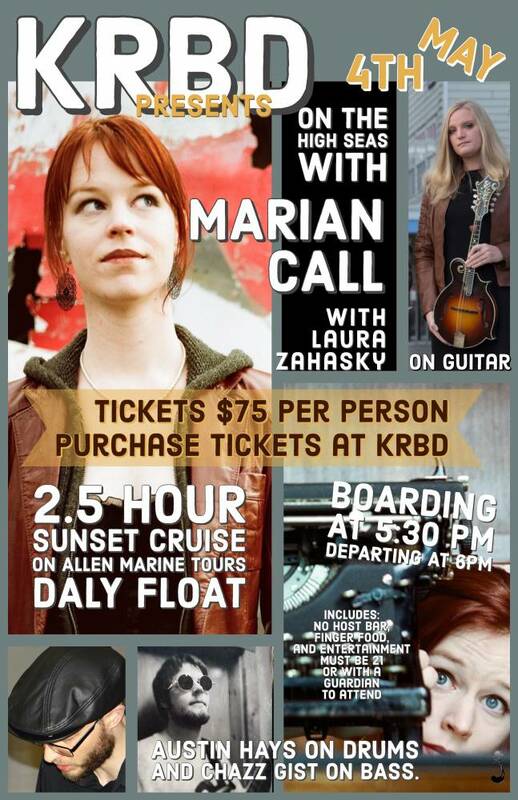 KRBD Presents On The High Seas With Marian Call, Saturday May 4th. A 2.5 hour sunset concert cruise on board Allen Marine Tours. Boarding at 5:30 PM and departing at 6 PM from Daly Float, downtown by the docks and the Christmas in Alaska store. Returning to Daly Float at 8:30 PM. Featuring Juneau native and Rasmuson Award-winning artist Marian Call on vocals & typewriter. Laura Zahasky on guitar. Austin Hays on drums. Chazz Gist on bass. Enjoy a no-host bar, finger food, and entertainment. Must be 21 or accompanied by a parent/guardian to attend. Tickets: $75 per person.Available at KRBD Studios, or purchase them here via PayPal.